How to Keep Your Torch Burning Bright for Christ. After indulging in food in a manner that crossed the clearly marked line between pleasure and gluttony, again. I was a little dumbfounded and overwhelmed with this habitual, willful sin in my life. I was dumbfounded because I’ve had moments when I was able to walk away from abusing food. I also was overwhelmed because here it was again, and I was tired of repenting for this same sin. Afterward, my behavior mirrored those of my ancestors in the garden of Eden. I hid and then I tried to fix my nakedness. I dug around some of my favorite Christian resources, seeking to find something on this topic. I found this blog post on Desiring God. The author wanted to encourage young Christians in their walk with the Lord. I’m not exactly a young Christian, but I am a wobbly infant in Christ (less than a year and a half). The author points at something I never considered in overcoming temptation and fighting sins. He says, “sin is conquered by bigger loves, not by bigger muscles.” All this time I’ve been praying for self-control when according to the author I need to love God more than I love sin”. That one thought started the ball to rolling in my mind.Had my love for the Lord gone cold? Was this gluttony or idolatry? Was I trying to serve two masters at once; my appetite and God? In my defiance to honor God with food, had I made the choice which of the two I would serve? I can still remember those first few months after Christ, the eagerness, and excitement. I remember those hours I spent reading the Bible. How every verse evoked sheer unbelief. I was bright-eyed and bushy-tailed with all the new discoveries. I discovered that I was deeply loved. I discovered I was chosen and appointed. I discover that my life had real meaning and purpose. And that somehow I was really precious to God. It was a time marked by many changes in my life, from depression to joy. A life of futility to a life upheld by God’s eternal purposes. Somehow I’ve lost my way along the way. 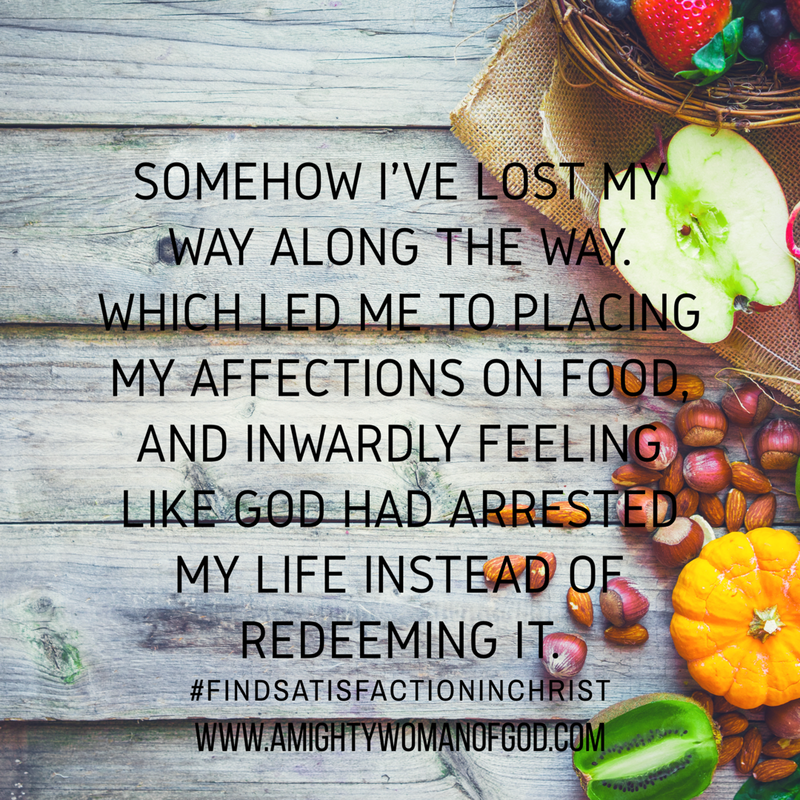 Which led to me placing my affections on food, and inwardly feeling like God had arrested my life instead of redeeming it. My weak flame for Christ had made a domino effect in my life. From my church attendance to personal worship, even down to my time in the Word. I’m sure that it even affected my personal relationships. Seeing the dangers hidden in possessing a low burning fire for God, I felt compelled to make a list. We can do nothing apart from God. We need to confess our lack of devotion so He can heal us. We need God to remind us what stirs up our love for Him. And also what has the ability to diminish our love for Him. What extinguishes our desire for Him may be improperly positioned friendships or relationships. The content we watch on TV or the Internet. Sports. The music we listen to may also be the culprit. While none of these things are inherently evil, we are counseled to guard our hearts (Proverbs 4:23). It sounds pretty simple, but this was the advice our Lord gave to the church in Ephesus. The problem wasn’t in the activities of the church in Ephesus, but that they had ceased doing them. What have you ceased doing? Do it again! I couldn’t compile this without the word of God. Scriptures are of essential importance because they focus our mind completely on the Lord. We are so often busy and so easily distracted, that God doesn’t become our sole focus. In the Bible we learn more about who God is, correcting our often incorrect thinking of God. We set our eyes on His promises. And too like Moses God allows His glory to pass before our very eyes. It’s only when our minds are on Him, that we find perfect peace (Isaiah 26:3). Nothing re-aligns our affections more than worship. In worship, we loudly sing, “Lord I give You the praise, not the gifts You’ve given me.” The truth is we are wired to sing praises and to worship, but if not unto God then onto who? Worship keeps the King on the throne of our hearts. Yet, beloved let us not chase our feelings in worship. We don’t worship to match the last experience we had with God, we worship Him because He is worthy. It’s often through worship that we are reminded of His eternal worthiness. We become aware that out of all the things the Lord has wrought for us, we get to worship Him. How often do we forget about what Christ suffered for us? At the cross is where we found Him, we shouldn’t hope to leave there. Pity parties and self-righteousness both loses their grip when we see Him who could rightly partake in pity. When we see Him who is truly righteous, alone. We are reminded at the cross of the great love that we are loved with. It’s only then that we can muster up love and offer it to our Savior. Saints, take fresh courage. Mourn for your sin and confess them to God, and believe you are forgiven. Remind yourself that Jesus Christ died for this sin as well, and love Him even more. Stand in awe of the mercy and steadfast love of the Lord. Thank God that you have a love that will not let you go. For the sake of suffering Servant, enjoy God. Jesus decreased from glory to humanity, from heaven to earth. He dwelled in the womb of a woman and was born completely helpless so that He could help us. He grew up in obscurity and surely didn’t live a lavish life. He wasn’t arrested, flogged, and hung for you to believe that you are not forgiven. Love the Lord with all your heart, soul, mind and strength (Luke 10:27), and fight to set your heart on things above and not on the perishing things below (Colossians 3:2).